We make a lot of tacos. And why not? Tacos rule! 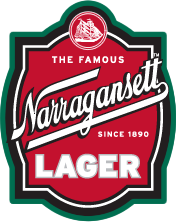 Excellent street or finger foods and not to mention they are great with a cold Gansett. Especially in the Summer time. Oh and the best tacos usually come from some sort of shack. So the other night we combined a few of our favorites to create a masterpiece. Fire up the grill, throw on some fresh local seafood and then slather it with tasty barbecue sauce. Now that’s dinner. Here it is. 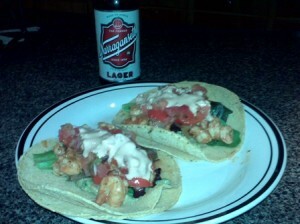 The recipe for our own barbecue shrimp tacos with our favorite toppings. 1. Whisk together the ranch dressing and chipotle sauce. Set aside. 2. Skewer the shrimp. (If using wood skewers, soak them in water for 10 minutes beforehand.) Season the shrimp with the sea-salt and pepper to taste. 4. Brush the skewered shrimp with the BBQ sauce. In this case we specifically used Dinosaur Roasted Garlic Honey BBQ sauce. Place them on the grill with the limes. Cook about 4 minutes on each side or until the shrimp are opaque and the limes are browned. Remove from grill..
5. Grill the tortillas for 30 seconds on each side, then place inside a paper bag to keep warm. 6. To serve, pull the shrimp off the skewers and divide them evenly among the tortillas. Top with the cabbage, Chipotle-ranch sauce, mango salsa, guacamole and a spritz of grilled lime.